Another hugely successful Vedic Mathematics conference took place last month in Bangalore. James Glover gives an account of this in our main article (at the end of this newsletter). This popular 9 week course consists of 36 video lessons, 9 tests and two assignments, plus discussion forums and optional challenge material. This fascinating article “Squaring Numbers Consisting of a Repeating Set of Digits" by Mike Greenlaw shows how to square numbers like 365365 or 365365365 etc. using simple addition. “Roughly 30 years ago I encountered a 'Recreational Math' column in Scientific American on the subject of prime numbers. The author exclaimed that, even after 2000 years of brilliant minds examining the problem, the distribution of primes was still a mystery for the most part, and he raised the question whether they might turn out to be random, after all. That column lit a fire in my mind. As a lover of puzzles, patterns and difficult challenges, I mustered my hubris and set out to attack the problem using addition, subtraction, multiplication, and division (no algebra, no trig, no calculus ... just plain arithmetic with a dash of geometry). Deploying these simplest of tools I've conducted 1000's of experiments over the past three decades to help me understand the distribution of prime numbers. Well, fair to say, it became an obsession. I now "grock" the algorithms that determine the distribution of prime numbers, and that the primes are the objects 'left behind' in the wake of a deterministic process that possesses perfect numeric and geometric symmetry. On Saturday, August 11th, 2018, in St. Louis city, Missouri, USA (temple premises) was filled with energetic kids ranging from elementary to high school. The kids appeared excited to show their talent after learning Vedic Mathematics during summer. Mr. Kantharao Minnaganti, on behalf of temple committee, introduced Srinivasa Ramanujan Mathematricks Club to the audience. He told to the audience that his daughter participated in the Vedic Mathematics summer program few years ago and got benefited in her school grades as well. We donated $5000+ to few non-profit organizations including $2300 from Summer program income. I introduced 14 topics and the participants answering each topic. Finding Triples, Square roots, Cube roots, Fifth roots, Filling a 5 X 5 matrix in such a way that the sum of digits in each row, each column and each diagonal equal to the given number, multiplication by 25 from left to right, writing decimal recurring places for a fraction like 1/29, 1/39, 1/49, 1/89 etc., framing a 12 digit number that is divisible by 13, computing the day for a given date, month and year, telling the missing digit in a 5 digit by 5 digit multiplication (using digit sum verification technique) are some of the topics. Audience asked plenty of questions on each topic and they felt amazed seeing how fast the kids answered those questions. The response to recurring decimal places for fractions like 1/49 (42 digits), 1/59 (58 decimal places), cube roots and fifth roots kept them spell bound. All the kids did an awesome job. Audience applauded the kids for their effort and quick responses. During the presentation of the triples topic, when a member of the audience gave a number, the other two numbers were given in less than 5 seconds by the 4th grader. Some of the kids went an extra mile and answered very tough questions from the audience. Many of the audience expressed that they spent quality time attending the program. They extended their support for future events in many ways and came forward to volunteer and/or donate money for the community service. Giuliano Mandotti, in his paper in the 2nd Online Vedic Mathematics Conference (12th – 13th March 2016) titled ‘Starring at the 9’, introduced very interesting application of Vedic Math technique for subtraction of a pair of two or three digit Mirror Numbers. He called it the ‘Starring at the 9’. However, for 4-digit Mirror Numbers Subtraction, he said “I do not see, for now, obvious patterns related to 9. I encourage you to help me in the search”. Taking inspiration from this invite, I have tried some examples to see if any pattern can be deciphered. I have observed a pattern for the difference of four digit Mirror Numbers. Pusapati Sivaram, Vedic Maths teacher from Tokyo Japan has published the paperback version of Workbook for the Elementary level Vedic Mathematics using Amazon's Print On Demand service. Now this Workbook is available (in English) in 8 countries: USA/Canada/UK/Japan/Germany/France/Italy/Spain. 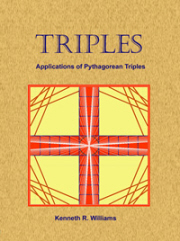 1) “Vedic Mathematics Teachers Manual, Vol.1”of Dr. Kenneth Williams. In fact, all the exercises of this Workbook are extracted from this Manual (along with the answers). We hope the this Manual/Workbook pair will enable all the VM teachers to conduct Elementary level VM course effortlessly. The theme for this channel is "Teaching Meditation through Mathematics". Efforts are ongoing to translate Intermediate Level Teachers Manual into Japanese. The 3rd International conference was held at the RV College of Engineering in Bengaluru from August 23-25, 2018. R.V. College of Engineering (RVCE) established in 1963 is one of the earliest self-financing engineering colleges in the country. The institution is run by Rashtreeya Sikshana Samithi Trust (RSST) a not for profit trust. RVCE is today recognized as one of India’s leading technical institutions. The delegates and speakers came from various countries like UK, USA, South Africa, Dubai and the Philippines, as well as from diverse parts of India, such as Pune, Delhi, Chennai, Nagpur and Hyderabad. The conference spanned over 3 days, where Day 1 and Day 2 were dedicated to the presentation of research papers, and student and teacher workshops were conducted on the Day 3. At the inaugural session, attended by some 300 people, speeches were given by Sri Syed Shahameer – Registrar of the RV Educational Institutions, Dr K.N.Subramanya - Principal of RVCE, Swati Dave – Trustee of IAVM, and the keynote speech by James Glover – Chair of IAVM. Swati spoke about the IAVM, its activities and rapid expansion and development. In his keynote speech, James spoke about the gift that India has given to the world. He described the expansion of English language, which is taught in around 60% of schools in foreign countries around the world, and yet the decimal system of numbers from India is learnt in 100% of schools around the world. All children across the world learn these numbers and it is a great gift from India. He went on to declare that Vedic mathematics could be the next great gift from India and how this has already taken root in provinces in the Philippines. The papers presented on Day 1 and 2 were of high quality and subjects ranged from new insights into Vedic maths, History of Indian mathematics, applications of Vedic algorithms to digital technology and on the impact of Vedic maths in education in India. Highlights were on Reverse Osculation by Geeta Ghormade, the Chhanda Shastra of Pingala by Shaifali Joshi, Kolam patterns by Gowri Ramachandran, Binary Arithmetic by Muthuselvie Prabhu, Applications of Graph Theory to ancient Shlokas by Prakash R et al, Prime number investigations by Peter Greenwood and Marianne Fletcher, Modular Arithmetic by Ushar Sundar and indeterminate linear equations by Ashwini Kale. All these papers, and more, demonstrated new research into applications of the Vedic maths sutras. The complete proceedings will be available by the end of this year. The third day was entirely taken up with workshops in five streams for High school teachers, primary school teachers, primary students, secondary students and college students. There were about 300 students and 60+ teachers. Most of the workshops were introductory. Of particular note were the sessions run by Dr Vasanth Shastri for college students on how to use Vedic maths to gain advantages in sitting public examinations. Our thanks go to Gowri Ramachandran, Marianne Fletcher, Geeta Ghormade and Kuldeep Singh for running the other workshops. All who attended showed great interest and enthusiasm for the Vedic methods. Many delegates expressed their sincere wish to have the next international conference at the same venue next year with extended workshops and without parallel sessions for papers. The IAVM is indebted to staff at RVCE for their generosity and hard work in managing all the logistics. In particular we would like to thank Raghavendra S.G.Prasad, Dr K.Sridevi, Head of Mathematics, and the faculty of the Maths Department for organising and enabling the smooth running of the conference.